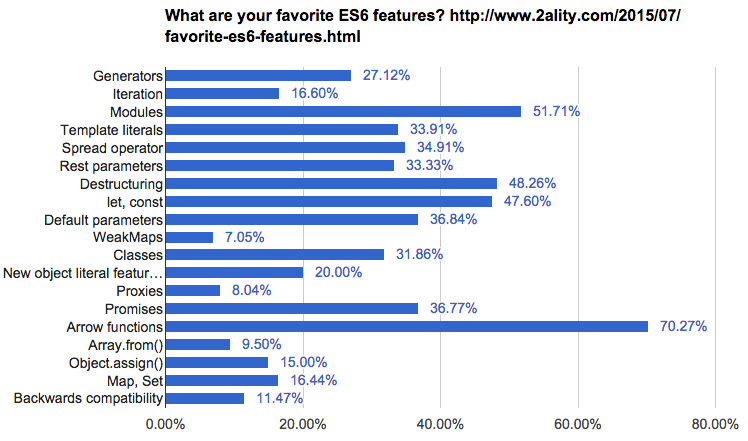 The good news is that many major modern browsers support the use of arrow functions. This post will cover the details of arrow functions — how to use them, common syntaxes, common use cases, and gotchas/pitfalls. Arrow functions – also called “fat arrow” functions, from CoffeeScript (a transcompiled language) — are a more concise syntax for writing function expressions. They utilize a new token, =>, that looks like a fat arrow. Arrow functions are anonymous and change the way this binds in functions. There are a variety of syntaxes available in arrow functions, of which MDN has a thorough list. We’ll cover the common ones here to get you started. Let’s compare how ES5 code with function expressions can now be written in ES6 using arrow functions. The arrow function example above allows a developer to accomplish the same result with fewer lines of code and approximately half the typing. Parentheses are required when no parameters are present. Arrow functions, like function expressions, can be used to return an object literal expression. The only caveat is that the body needs to be wrapped in parentheses, in order to distinguish between a block and an object (both of which use curly brackets). Now that we’ve covered the basic syntaxes, let’s get into how arrow functions are used.